Posted on September 11, 2013 August 30, 2015 by SherylPosted in Food, recipesTagged crab apple, jelly. Mmmmm, I’m glad you have much more to say on those days your grandma doesn’t. Isn’t crab apple jelly one of the best jellies? I love it. Are the crab apples from your own tree, or do you forage them like I do? They do make a really nice jelly. The crab apples are from a friend’s tree. She gives me a bag of them each year. I didn’t know you could eat crab apples. What a delightful idea. Since crab apples are small, it takes a bit of effort to prepare them for use in a recipe–but they make very nice jellies, chutney, pickled crab apples, etc. Grandma’s back to be “quiet” about how she spent her day…. The level of detail in her diary entries sure does vary from day to day. I like the way you describe crab apple jelly. It does have a really nice flavor and color. An aside–I’ve been looking for quinces so that I can make quince jelly–but haven’t been able to find any. I have memories of eating quince jelly when I was young and thinking that it tasted really awesome. Used to make crab apple jelly years ago when I had a crabapple tree, had to cut it down due to disease and have not made this lovely jelly since. Thanks for the memories. Thanks for taking a moment to write the nice note. It’s always wonderful to hear when someone particularly enjoys a post. That jelly looks wonderful–you bailed Helena out again! My grandma always told me you couldn’t eat crab apples. Hmmm. Now inspired to see if the tree that inspired that bit of misinformation still fruits! Interesting. . . Crab apples are kind of a pain to cut up to put in a recipe since they are so small, but they are edible. 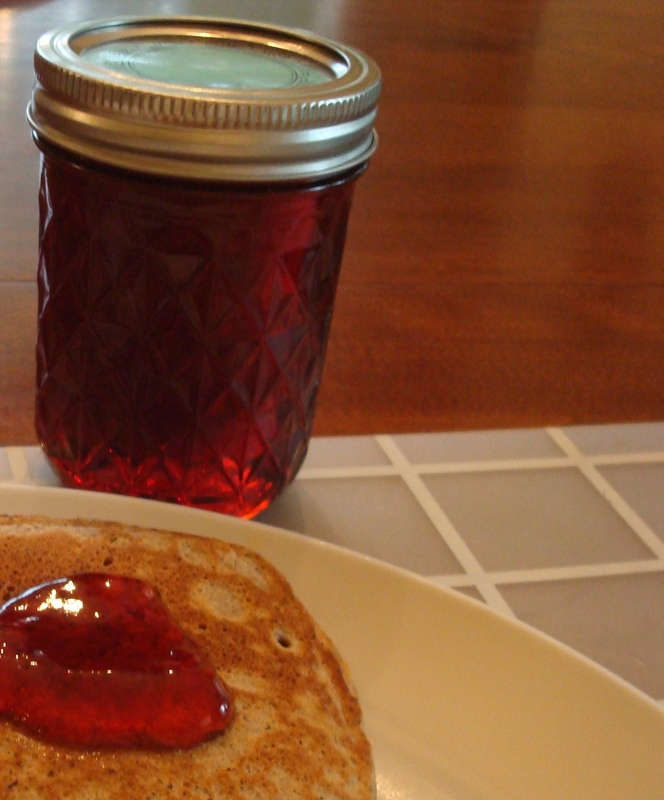 I have Crabapple Jelly EVERY morning on my toast, there is NO substitute. I’ve never made my own. Do you have to peel all those little apples first? Yoy. Hey, wow I also never knew there was SO much sugar involved, geez..3/4 cup to 1 cup of juice? yipes! No you don’t need to peel them since you put the pulp through a jelly bag. Just remove the stem and blossom ends, and then cut into half. Your Grandmother was a woman of few words. I agree she had to have done something. Life was always busy on the farm when I grew up. I love your recipe. I really need to get my crabapples picked. Wonderful! The crab apples are in season here, too. I remember biting into the extremely tart fruit as a little girl, wondering, “Maybe THIS one will be sweeter.” Never happened. I can hardly wait until the crab apple leaves turn those beautiful colors that only nature seems to know how to produce. when I made this I ended up with only 4 1/2 cups of liquid. And it’s very thick. Should I add water or just go with what I have? Based on what you wrote, I’m assuming you measured the juice after you strained it through the jelly bag. I’m a little befuddled about why the juice is very thick at this point. That said, I don’t think that you need to add water. Since this is an old-fashioned traditional recipe for jelly–and doesn’t call for the addition of a packet of commercially-prepared pectin–there is no need to have a particular amount of juice. Instead adjust the amount of sugar based on the amount of juice that you have. Use 3/4 cup of sugar for each cup of juice. Since you have about 4 1/2 cups of juice, you should use about 3 1/3 cups of sugar. Since the juice is very thick it will take less time to reach the jellying point than if it was thinner. Since you have less than the expected amount of juice, you may end up with fewer pints of jelly than what is listed in the recipe. Thanks. I went ahead with what I had and it turned out great! I added a vanilla bean while boiling and it tastes great! Thanks for letting me know. I’m glad that it turned out well. I’ll have to try adding a vanilla bean sometime. Is it suppose to be a bit bitter, or did I do something wrong? It is a tart jelly (and in many ways I think that it is similar to another tart jelly – current jelly), but I won’t call it bitter. Over the years, I’ve made crab apple jelly both with and without the use of pectin. When it is made the traditional way without pectin (like this recipe), the jelly color is darker and the flavor is more intense than the modern pectin variety. This is because it is cooked longer and more of the water evaporates out of it. The variety and maturity of the crab apples that you used probably would also effect the flavor. My grandmother had a Crab Apple tree in her yard. She made crab apple jelly every year. She had jars and jars of it. Haven’t had it in years. I miss it!